That, my friends, is the sound of major frustration! ... and all by 4PM on Day 1. Something so simple eh! A small first aid plaster! Hmmm - Lets rewind back to yesterday morning. ...and then the pain started! "Would you like a plaster for that?" asked the Learning Assistant. My automatic reaction was "Yes please" and I returned home with no afterthought, well not until later in the afternoon, when the plaster fell off my finger and I felt thwarted! It can't be recycled....or composted...and it certainly can't be reused (eurgh)...It has to go in the bin. So, unless there are any other suggestions, I'm afraid I've created a bit of an anti-climax. In fairness I do feel the innocent party though. Maybe it won't count because after all I didn't buy the plaster and by the look of my cut, I didn't have a choice. However, the good news is that the only item to have been thrown in the bin on day 1 is just one plaster. Hooray! After such a minor incident, the day finished off on a real positive note with a LETS meeting at one of our local pubs. For anyone who hasn't heard of a LETS group, it is a Local Exchange Trading System, which enables people to swap favours or unwanted items for points. This means that it is excellent for recycling things. It's a bit like Freecycle, except people actually meet up at a social gathering and you get points for anything that is traded. Our local Bury LETS group has been going for donkeys years and meets on the 10th of every month. At the moment the group's membership is small and compact, so we can meet in places that are small and bijoux. Despite its size it is a very effective. 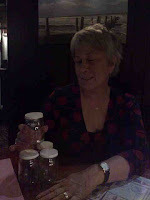 Take last night, I took along a few glass yoghurt jars and one of the members thought they would be great for storing her spices that she gets from a local health food shop. Result! You can see Val happily modelling them! I think they've gone to a good home, don't you? After sorting out the jars, the discussion got on to websites and before too long she had also managed to sort out Web Hosting with one of our members who is a developer and knows about all things techy. As for me, I picked up some very interesting books, including a copy of Semi-Detached by Griff Rhys Jones. Of course, the evening wouldn't have passed properly without any talk of rubbish, especially as another member is also participating in Zero Waste Week. Remembering that we had to create minimum waste while we are out and about, we were extremely proud of the questions that we fired off to the staff, including my fellow rubbish dieter's request for loose sugar instead of the pre-packed sugar portions that are normally provided with teas and coffees. 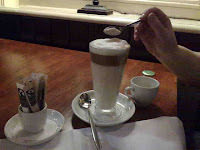 The evidence can be seen in the photo, after the member of staff attentively returned with a small cup of sugar, which was used instead of the packets. Why is the country obsessed by small packets? Is it for the look, the convenience or health and safety? If it's not the latter, surely it is time to go back to loose products in favour of reduced packaging. Sugar's not the worst offender. I've got my eye on those little packets of sauces, which you squeeze and squeeze until the cows come home but so little comes out of them that a second packet needs to be opened. What's wrong with ketchup bottles. I ask?! So if the council are looking in, please can we overlook the plaster in favour of the tremendous efforts made at the pub last night? We really did our bit you know! On a final note, I'd just like to thank everyone for popping by yesterday and to all those who left comments. Thank you so much for your support and for your enthusiasm. I've had some fabulous feedback following the Woman's Hour column and I hope you enjoy the rest of the broadcast, which is being aired throughout the week. Also, I'd like to extend a very warm welcome to listeners of the Moncrieff programme on Ireland's Newstalk channel. I'm scheduled to take part in a live interview this afternoon at around 2.45pm, which means The Rubbish Diet is going International! I know it's just over the water, but it is still overseas! How did this happen? I only meant to sign up for a Zero Waste challenge and write a blog! Anyway, if you get a chance, you can listen live on the Internet at http://newstalk.ie/newstalk/index.html. I think you can be let off one plaster, & thanks for your reply to my earlier comment. The company I work for is made up of a bakery, tea & coffee blender, cookery school & 6 tearooms/ shops, and yes, our aim is ZERO waste to landfill within the next two years. The tea & coffee division is almost there already - they've been working on it a while & the biggest recycling guru in the firm is based there! Their packaging waste goes to schools & community groups for crafts & tea & coffee waste is composted. I'm based in one of the shops, and we're only just getting started - with not nearly enough help from our local council, despite their green claims! ~ Recycling vegetable oil (into bio-diesel) & glass. ~ Sending some bottles back to where they come from for re-filling. ~ Giving aluminium to the local Guide Dogs and Scout groups to be recycled & raise them some cash. ~ To find some community groups to take some of our food waste off our hands - much of what we throw out is still perfectly edible, just not able to be sold the next day (bread, for example) - we already have one rehoming hostel on board but are looking for more. ~ To set up some sort of composting system for the rest of the food waste - this one's the biggie as it will involve a big investment of cash, space & effort, and we'll have to find somewhere for the finished compost to go! Hmmm...I was wondering what you do with plasters, snotty tissues (sorry) and the like since they can't really be recycled at all, though I suppose they can be reduced in a domestic situation (proper hankies, for example). I suppose you could flush tissues within reason, when you were flushing anyway! At the moment I'm suffering from gestational diabetes and all my hypodermics (3 a day) and testing needles (6 a day) - they are made mostly of plastic - just get dumped at the hospital in the sharps bin, so I've had 'medical' waste on my mind a bit. Have you ever tried liquid plaster? I don't know how eco friendly it is but we use it because... well, because it doesn't look like you have a plaster stuck on your finger and by the time the cut's healed, it's gone. No waste. Hi Mel - wow, your company sounds so interesting. It's very diverse, which must create quite a few issues that need to be tackled. Maybe one of the other readers might be able to make some suggestions regarding your hit list. It sounds like a great effort that everyone is making. Well done and thanks for the well wishes. Hi Anonymous - Thank you for going to the trouble to translate my rubbish messages. That is wonderful! What is great is that there is so much enthusiasm out there, even if it isn't obvious. What I've discovered is that the majority of people that I have come across would love to know how to tackle their rubbish, but the ideas haven't been so transparent before. So keep plugging at it and do let me know how you are doing. Hi Sharon - Thank You. I'd never thought of that. I think that will be another one on my list, but you're right, I'd better check it out first. Thanks so much for your comments everyone. I hope you don't mind the delay in getting back to you. It's very busy in the Almost Average Household at the moment. Thanks again for your support and encouragement. Could you wrap a fairy hammock around the cut? Hi Baba - thanks for all those suggestion...no I can't put it in a neighbours bin...that's not allowed. But great idea about the public sanitary bin though! Thank you. Am reading your old posts - lol! We are too obsessed with throwaway medical waste as a society!! A bunch of my relatives from the chemical-polluted city have diabetes too.. Those that managed to stick to better nutrition are on pills, one loves cookies too much..!! One aunt (who is on pills) is experimenting with drinking tea from bean peels/pods & she says there's an improvement already!! might be worth a try...? I hear a lollipop blood-sugar test has been invented for diabetics too, to just lick & no needles needed! Just curious, Mrs A, what do you use now instead of bandaids? - never heard of these liquid bandaids before..?